Set on a cliff overlooking the open Pacific, the phenomenal sea-scapes of this exceptional award winning contemporary home offer an intoxicating coastal experience. Visionary architecture and fine craftsmanship create unique light filled spaces accented by artistic custom detailing. A compelling mix of rectilinear and curving lines produces a distinctive ambiance of sensual modernism, punctuated by contrasting rustic elements. Spread over three floors, this 4,563 sq.ft. four bedroom home can comfortably accommodate a variety of lifestyles. <?xml:namespace prefix = o ns = 'urn:schemas-microsoft-com:office:office' /> The incredible upper level, a 915 sq.ft. curved loft, is devoted entirely to the sophisticated master suite. Open to the 2� story vaulted glass atrium of the main floor, this captivating space offers unobstructed panoramic views. Features a seductive open bathing area, romantic gas fireplace, dramatic light fixtures and spacious walk-in closet. The stone and walnut wood of the beautiful custom floors meet in a remarkable rippling line, echoing the shoreline below. Bathed in colour and light...One thousand square feet of glass envelopes the home, virtually dissolving the boundary between the interior and the stunning surroundings. Featuring the innovative use of contrasting maple woods, the custom cabinetry of the gorgeous kitchen is striking and original. Recipient of a 2007 Gold CARE award, from the Canadian Home Builders Association, this inspired design includes granite counter tops, Frigidaire appliances, a rounded raised breakfast bar and masterful curving tile-work. The property includes 3/4 of a magnificent rocky beach. Currently accessible by a short climb down the rocks, this is a favourite spot of the present owner. Beach comb at low tide or simply relax and enjoy the restorative calm of the idyllic setting. Enjoy spectacular sunsets from every room, as well as intimate views of eagles, otters, sea lions, harbour seals, otters, Orca and Grey whales. Unwind in the master bath to mesmerising ocean views while soaking fireside in the free-standing designer tub. This stylish space features radiant stone floors, two person glass block shower, enclosed water closet, and dual sinks. A bright 1880 sq.ft. lower level offers a fantastic two bedroom suite, perfect for guests or teenagers. Other desirable features include: every room wired for state of the art media and high speed Internet, in-ground and site ready for hot-tub installation, a spacious utility room, two car garage and wood burning fireplace. The property also boasts it's very own seasonal waterfall. 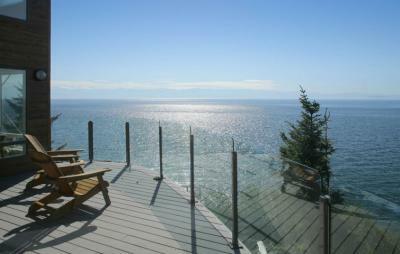 The residential community of French Beach is 60km west of the city of Victoria. Outdoor adventures abound, including hiking, kayaking, or biking the myriad natural wonders of neighboring French Beach Provincial Park and Sheringham Point. The world famous 75km West Coast Hiking Trail lies 45 minutes west, while the highly popular Galloping Goose Bicycle Trail begins to the east, continuing into Victoria and beyond. Close to the many amenities of the nearby town of Sooke, award winning gourmet restaurants and good shopping are only 20 minutes away. Come visit this magical place...Tantalize your senses, and refresh your spirit, amidst an ever changing canvas of sea and sky.